Holly Cousens, was born in Pensacola, Florida, she moved to Yakima WA in 1992 and graduated from Eisenhower High School. It was in her high school years that she took her first business classes and, through her involvement with the DECA club, fell in love with business. Holly spent a few years at Yakima Valley College where she obtained her 2-year Business Management and Marketing Degree. 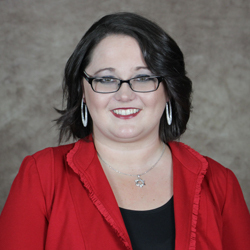 While at YVC, Holly served in several leadership positions with Delta Epsilon Chi, including a position as National Western Region Vice President. She then obtained her BA degree(s) in Marketing and Human Resources through City University of Seattle. While receiving an award from the Governor, Holly was asked, “Why are you not continuing your education?” Holly didn’t have a good answer, so she applied for graduate school and obtained two masters degrees, one in Organizational Leadership and the other in Business Administration (MBA) from City University of Seattle. Holly is passionate about giving back to her community and works full time teaching Business Technology at Yakima Valley College, as well as working at Entrust Community Services helping people with disabilities.